This post represents another installment in the series detailing the first of our three cross country National Parks camping trips, travel trailer in tow. 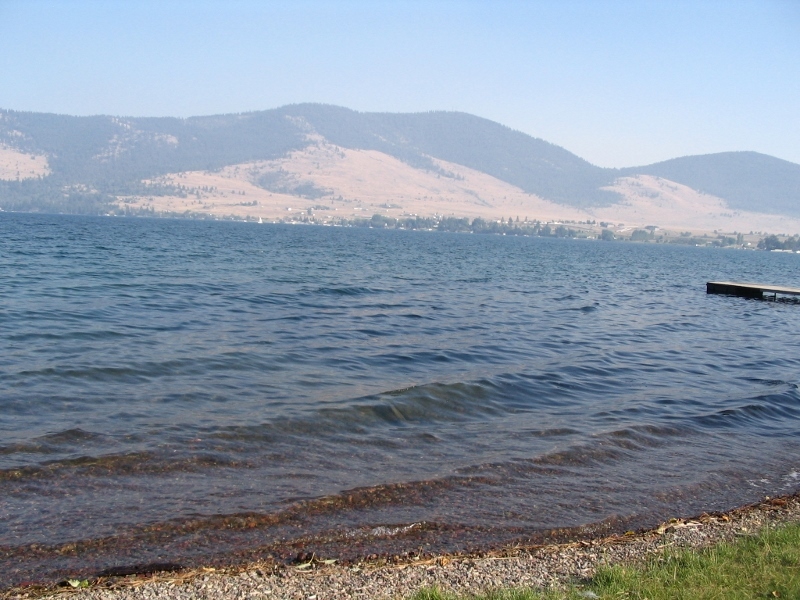 With reservations set at the West Glacier KOA for the next two nights, we pulled out of Itch-Kep-Pe Park in Columbus, Montana and headed west once again. Glacier National Park in northwestern Montana would be the westernmost point of this epic adventure; after a visit there, we planned to drop down into Yellowstone. When we left Itch-Kep-Pe, we were more than 2,000 miles from home; by the time we reached Glacier, it would be nearly 2,500. By choosing to enter Glacier from the west, we were able to enjoy morning coffee with our friend Bob as we passed through Montana on Interstate 90. Bob and his wife Audrey (a colleague and friend from my banking days) had retired to the “Big Sky” state some years back. Although Audrey’s schedule didn’t allow her to join us that morning, we were all looking forward to catching up a few days later since we had planned to camp together in Yellowstone – yay! Living in the area of the northeast that we do, we almost never need to worry about wildfires. But that’s not true for many people living in the western part of the country. During summer months, especially, fires frequently rage for extended periods of time. While the dedicated firefighters work extremely hard to contain the fires and protect life and property, sometimes the only thing that actually extinguishes a fire is the rain that arrives in the fall. A difficult fact of life to deal with, I’m sure. The wildfires that occur near populated areas get the most press because of the sheer number of people that may potentially be affected – such as the California wildfires of this past summer. But many wildfires burn across the western states without anything other than local press coverage. I often take for granted the clear blue skies of summer in the northeast while many fellow citizens in the west deal regularly with the danger, haze and poor air quality caused by wildfires – some of them hundreds of miles away. Our friend Bob was monitoring a fire burning on the Route 93 corridor – the route we would be taking north from I-90 in order to reach the KOA in West Glacier. Bob was no stranger to the threat of wildfires, having retired to Montana a number of years ago and having pulled a couple of stints as a campground host in the Yellowstone area. When we met for coffee that morning, Route 93 was open, but Bob urged us to push on through as soon as possible. So, keeping our fingers crossed for safe travel through to West Glacier, we headed north. We passed the firefighters’ base camp and then part of the fire itself. 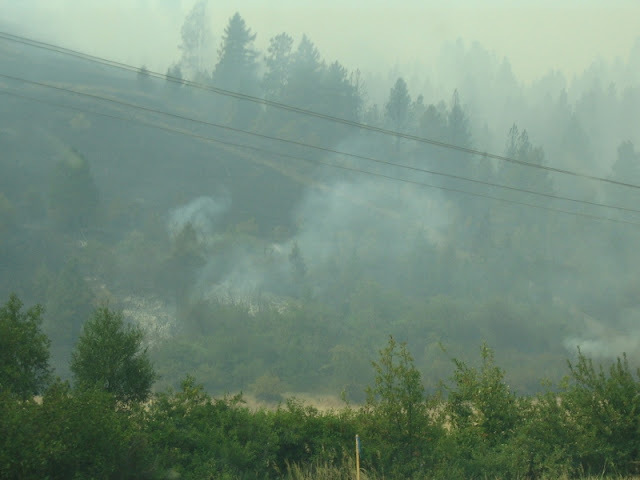 As it turned out, the wildfire in the Route 93 corridor was burning immediately west of the highway – as in right off the highway with both smoke and flames visible. The closer we got, the thicker the smoke became. It was while watching the efforts of these firefighters that we all realized what an incredibly difficult and dangerous job these men and women tackle on a regular basis and I offer a solid round of applause for their dedicated and diligent work. Three cheers for the firefighters who make the protection of life and property their life's work! Route 93 remained open long enough for us to make it through, although we heard later that it closed shortly after our safe passage. We continued on to Flathead Lake State Park – which made a perfect stop for an early supper and a quick swim before pressing on to the KOA in West Glacier. Supper break with fresh air and a lakefront view - delightful! The KOA proved to be a good home base for us while we were exploring Glacier National Park and Alan and I enjoyed the kids’ delight as we poked around Lake McDonald and traveled the Going-to-the-Sun Road. I often comment that every Park has its own personality and I believe that’s what makes each visit to a Park so exciting and memorable. Since we didn’t want this visit to be memorable for the wrong reason, we did cancel our planned hike along Avalanche Creek due to a fairly recent mountain lion sighting in that area. (Our daughter, a petite 8 year old at the time, looked a little too much like “snack size” and we chose not to take any chances.) But our kids were able to walk the shoreline of the lake, skip stones, watch the nimble mountain goats on the hillsides and picnic at Logan Pass. Lots of smiles (lots of photos) and lots of great memories – for one and all. Can you imagine this view on a clear day?! 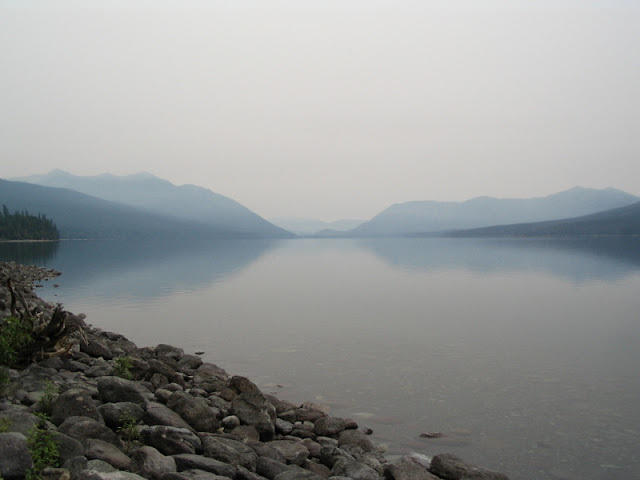 As for the wildfire and the smoky haze it caused, it did somewhat diminish our enjoyment of Glacier’s spectacular scenery. But, as with any trip, we made the most of our time there and said a prayer of gratitude that the firefighters were able to contain the blaze on the Route 93 corridor. Their efforts protected the people and property in the area and allowed us safe travel south toward Yellowstone – and our camping adventure with good friends Bob and Audrey. If you’d like more information on Glacier National Park, you may wish to visit the National Park Service web site (link HERE). Also, be sure to visit Walking the Parks (link HERE) because Glacier is an absolute favorite of blogger Ladona Stork and her husband Brad. You’ll be able to read about their adventures and see photos much better than mine on Ladona's blog! As for our Yellowstone adventures, they were awesome! 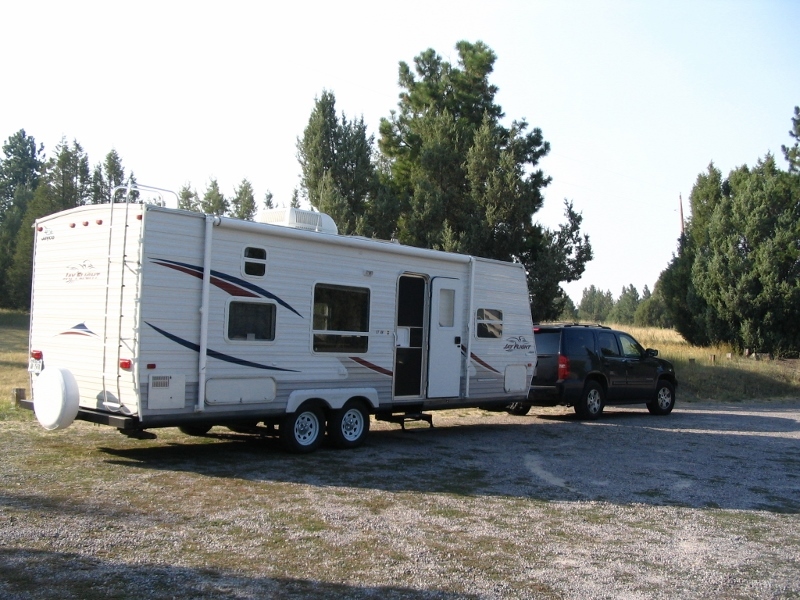 And, I’ll be posting in the not too distant future about a major turning point in our camping career that occurred in Yellowstone National Park. Thank you for visiting and please come back soon! Thanks for the shout out Mary! 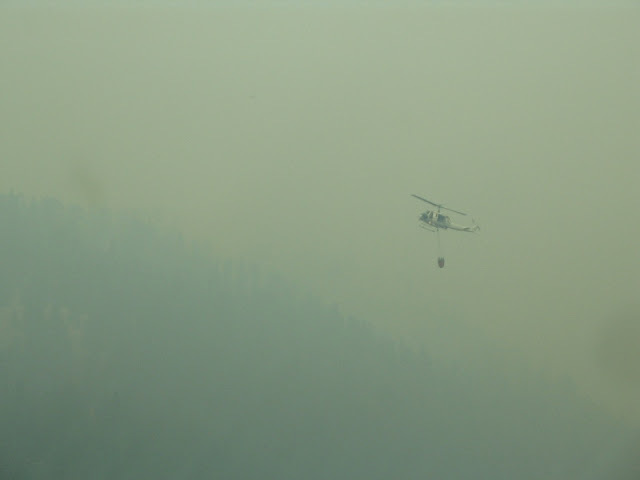 You really captured the impact of the fires in Glacier with your photos. Those firefighters have a really difficult job keeping the park safe for us. I agree! I can't even imagine the devastation that would occur if so many men and women didn't step up to take on this incredibly tough job. By the way, remember the 10" of snow you recently received? We were hit yesterday - blizzard like conditions resulting in 10" of snow and no power. If it happens again, please remember - there's no need to share. :) Have a happy weekend! 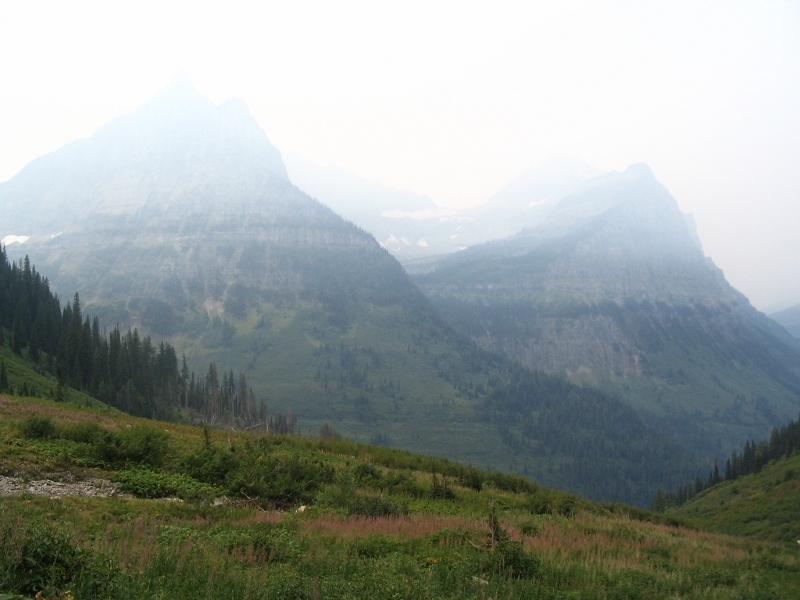 We did Glacier last summer and, fortunately, the smoke at the time was not significant, so we got some great pics. However, terrible smoke from fires did keep us from traveling the Beartooth Highway, one of our bucket list items. We'll just have to go back when conditions are better. This past summer, it was our visit to Crater Lake that was affected by a wildfire. We arrived a day or two before all or part of the Park was closed, but our views were already hampered by the smoke. As you said in reference to the Beartooth, we'll have to go back when conditions are better.